Though I’ve had a DISH Hopper with Sling since the beginning of 2014, until recently I didn’t use the Sling feature at all. In fact, I wasn’t even sure what Sling was. That changed a few weeks ago. I wanted to watch the evening news on our park model patio, but I didn’t want to drag a large TV out there. So . . . I knew enough about “Slinging” that I thought I could watch TV using my iPad and our Hopper with Sling. After a little research, I found that in order to do this, I had to download the DISH Anywhere app on my iPad. Also, both my iPad and Hopper had to be connected to the Internet (more on this later). Once the app was installed and both the iPad and Hopper were connected to the Internet, viewing live TV programs and recorded shows on the Hopper’s DVR was a breeze. By the way, since we have two Hoppers, we can view and play recordings from each of the Hoppers. Using DISH Anywhere, the image quality of a TV show or recording is dependent on the speed of the network you’re using. For example, if both iPad and Hopper have fast network connections, watching HD (High Definition) programs should be possible. However, if one or both the iPad and Hopper are on slow networks like 3G, then even watching SD (Standard Definition) programming could be a challenge. For example, at low connection speeds, video can appear blurry and jerky. When our Hopper is connected to our Verizon 4G LTE WiFi network with connection speeds up to 18 Mbps, the TV shows streamed to my iPad were seamless — high quality video and no “herky jerky” screen motion. On the other hand, when I used a slower network, which was about 2 Mbps, video quality noticeably degraded. 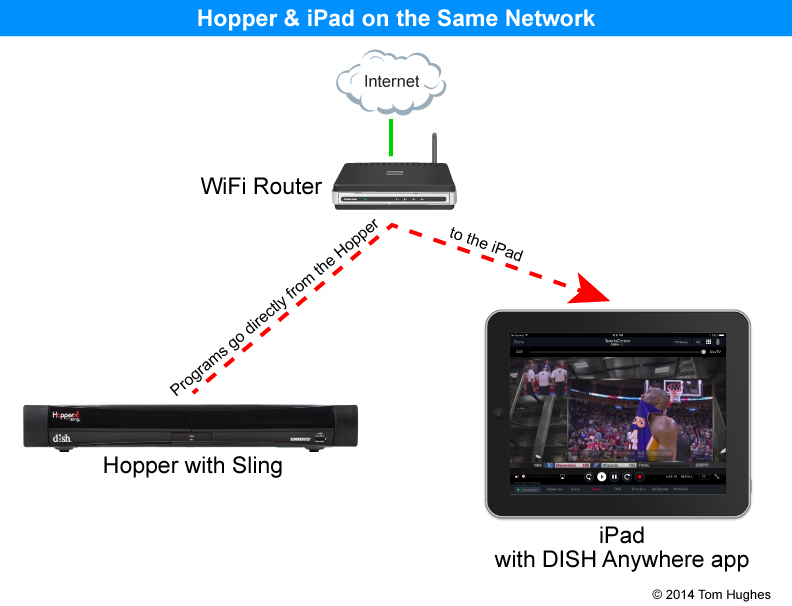 If the Hopper with Sling in your house (or RV) is connected to the Internet, then with an Internet-connected iPad (or iPhone or web browser) you can watch live or recorded shows streamed from your Hopper anywhere on the planet. If your Hopper with Sling and your iPad are on different networks, then you could potentially use a great amount of data while streaming programs to your iPad. If you’re using a cellular data network (Verizon, AT&T, etc), then you probably do not have an unlimited data plan. When I streamed a 2-hour SD TV show to my iPad, I used over 1 GB of data from my Verizon cellular plan. On the other hand, if a Hopper with Sling and the receiving device (iPad, iPhone, etc) are both connected to the same network, then no data is used. SO SAME NETWORK = NO BROADBAND DATA USAGE? Yes! (except for a negligible amount). Same Network = No Broadband Data Use. Different Networks = Lots of Broadband Data Use. What first led me to this was comparing the LAN/WAN data use by Apple TV AirPlay and by DISH Anywhere. First, I already knew that Apple’s AirPlay technology streamed data directly from a home computer to an Apple TV without using any broadband data. For example, when iTunes streams a movie that is on your computer (not on the Internet) to a television that is hooked up to an Apple TV box, the movie uses your home network — not the Internet. So no broadband data is used. All the movie data is streamed over the home network. Note that in order for AirPlay to work, the sending device (your computer) and the receiving device (Apple TV) must both be on the same network. I figured this same principle applied to DISH Anywhere. AirPlay only streams on a LAN, not a WAN. DISH Anywhere – allows either LAN (same network) or WAN (different networks) Streaming. 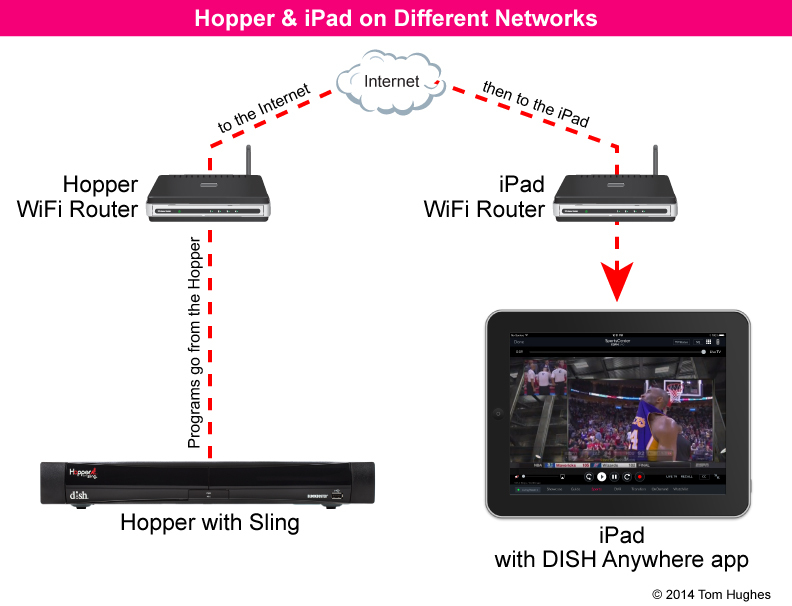 Compare the Apple Airplay data stream with DISH Anywhere (Hopper with Sling and an iPad) on the same network — it’s identical. Though the data speeds are different, both AirPlay and DISH Anywhere (when devices are on the same network) use a LAN to stream data. Broadband data is not used. Finally, I thought it would be a good idea to actually measure the broadband data used by DISH Anywhere. CradlePoint MBR95 — connected to a Verizon UML290 with access to 4G LTE. Apple Airport Extreme — connected to 3G microwave radio. These two WiFi networks allowed me to connect my Hopper to one network and my iPad to another. Also, of course, I could connect both Hopper and iPad to just one of the WiFi networks. 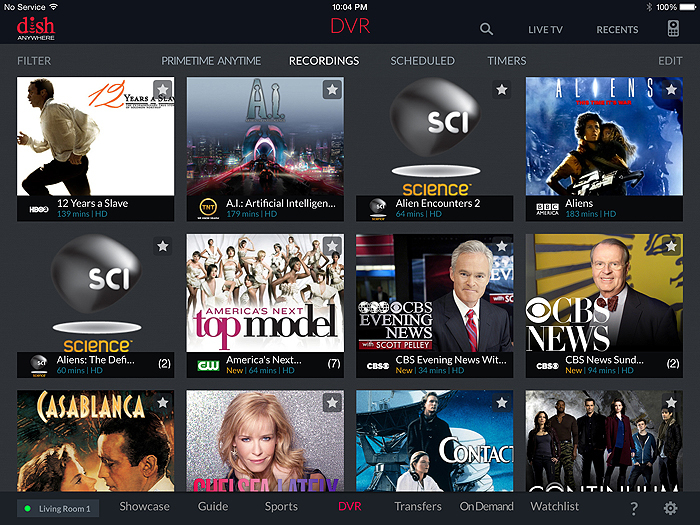 I am considering switching from DirecTv to DISH at home and in our RV. Our goal is to be able to take shows recorded at home on a Hopper with Sling and watch them on the TV in the RV. We have NO INTERNET ACCESS where our RV is parked most of the time. First I thought the cheaper way to do this is to use the Dish Anywhere App to download the shows at home to the ipad (ipad and Hopper would be on the same home network). Then I would take the ipad to the camper and, using Dish Anywhere, you are supposed to be able to view the video on the ipad without an internet connection. Then what I wanted to do was to use an Apple AV adapter to mirror the video to the TV screen (with an HDMI cable) OR purchase an Apple TV and mirror the video to the TV wirelessly. However, posts on several forums (albeit they are all 3-5 years old) indicate that while you can use Dish Anywhere and mirror Live TV this way and even mirror you home DVR (if you are streaming to the ipad from your DVR (requires internet)), but you cannot mirror recorded TV shows that are on the ipad. Apparently there is a purposeful block in the Dish Anywhere app that prevents the ipad from mirroring that specific content but allows the live TV and streamed DVR to be mirrored. Some Dish sales reps suggested using the Hopper Go device, but I am afraid I would be in the same predicament. The Hopper Go requires the Dish Anywhere app on the ipad to control the Hopper Go to “stream” its recorded content to the ipad. If I then try to mirror that recorded content to our TV in the RV, I am afraid I would run into the same “block” noted above. No one at Dish can give me an authoritative answer on this. I have been struggling with this for a month with discussions with Dish and our local installer and searching the internet. We were planning on having a Wally receiver in the RV and this should work with our current Winegard Roadtrip satellite antenna to receive live satellite broadcasts in HD. Unfortunately, we cannot use the option to transfer the recordings on the Hopper at home to an external hard drive and then load them onto the Wally. I have read in several sources that this is not allowed. You can only use the external hard drive transfer between Hoppers and between a Hopper and a few other DVR’s but not a Wally. 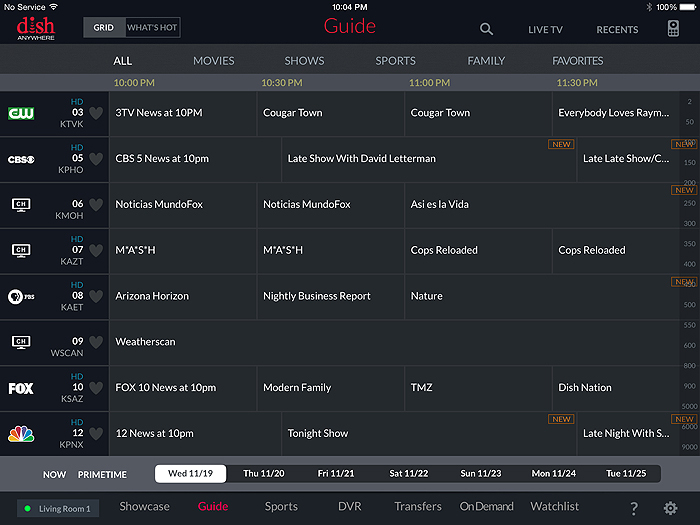 Even if the Wally has been activated for use as a DVR (one time $40 fee), you cannot transfer from Hopper to Wally. If I cannot get this to work, my remaining option to achieve my goal is quite expensive. I would have to replace my Winegard Road trip antenna with a Winegard Traveler antenna, and those are not cheap. Then I would have Dish install a Hopper with Sling at home and I would have to purchase outright a Hopper with Sling for the RV. In this manner I could be pretty confident I could take advantage of the ability to use an external hard drive to transfer the recordings between Hoppers and view them on the TV in the RV. No internet required, we would not be mirroring the ipad to the TV, and we would not be using the Dish Anywhere app. With a purchased DVR in the RV the Dish associates assure me I can “deactivate” that receiver when we are not using the RV, thus avoiding the $15/mo receiver fee. As my wife and I have been “researching” this online for sometime, we have come across several of your posts regarding satellite TV for RVers. 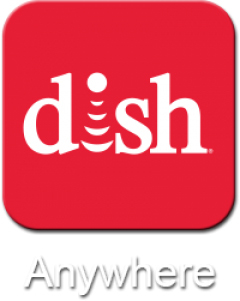 As I cannot get a definitive answer about the Dish Anywhere app blocking recorded content from being mirrored by Apple Airplay, Apple AV adapter or by Hopper Go, I thought I would pose the question to you. Your previous posts and blog make it clear that you are very current in your knowledge of Sat TV for RVers. I read your “about” introduction when I came across your site and it seems obvious you are still a “teacher”, just in a different type of classroom. Yes, a Winegard Travler would be the best solution, but that’s about $1100 (without installation). On the other hand, another option is taking a portable tripod, like a DISH 1000.2 or 1000.4 That would set you back only a few hundred dollars. However, portable dishes can be difficult to aim. You could just take your Hopper and your Wally in your RV. Remember, DISH doesn’t know where your Hopper is. Anyway, most TVs now have multiple HDMI inputs, so you could plug both your Hopper and Wally into your TV — the Hopper for a DVR, the Wally for live programming.